Reinforced Slab Bridges used For short spans, a solid reinforced concrete slab, generally cast in-situ rather than precast, is the simplest design to about 25m span, such voided slabs are more economical than prestressed slabs. Slab bridges are defined as structures where the deck slab also serves as the main load-carrying component. The span-to-width ratios are such that these bridges may be designed for simple 1-way bending as opposed to 2-way plate bending. 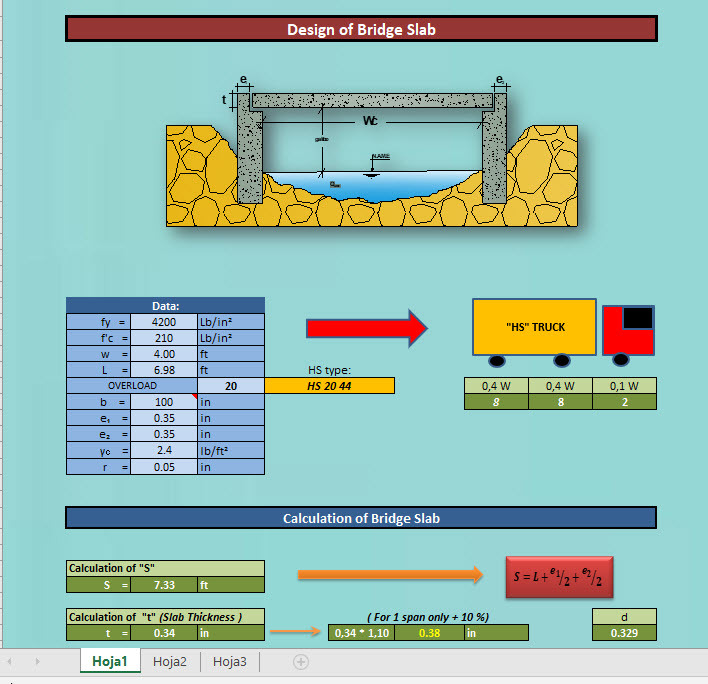 This design guide provides a basic procedural outline for the design of slab bridges using the LRFD Code and also includes a worked example. The LRFD design process for slab bridges is similar to the LFD design process. Both codes require the main reinforcement to be designed for Strength, Fatigue, Control of Cracking, and Limits of Reinforcement. All reinforcement shall be fully developed at the point of necessity. The minimum slab depth guidelines specified in Table 2.5.2.6.3-1 need not be followed if the reinforcement meets these requirements. 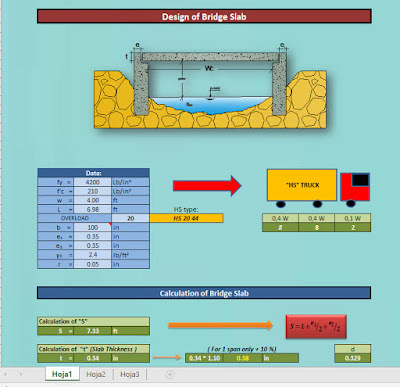 For design, the Approximate Elastic or “Strip” Method for slab bridges found in Article 4.6.2.3 shall be used. According to Article 9.7.1.4, edges of slabs shall either be strengthened or be supported by an edge beam which is integral with the slab. As depicted in Figure 3.2.11-1 of the Bridge Manual, the #5 d1 bars which extend from the 34 in. F-Shape barrier into the slab qualify as shear reinforcement (strengthening) for the outside edges of slabs. When a 34 in. or 42 in. F-Shape barrier (with similar d1 bars) is used on a slab bridge, its structural adequacy as an edge beam should typically only need to be verified. The barrier should not be considered structural. Edge beam design is required for bridges with open joints and possibly at stage construction lines. If the out-to-out width of a slab bridge exceeds 45 ft., an open longitudinal joint is required.